Keywords: age, conditions of menstruation, menopausal complaints. Menopause is the last phase of a woman's menstrual bleeding which stopped altogether. At the age of 50 years, menopausal women that happens a decrease or loss of estrogen hormones that cause women experience a complaints or disorders that often interferes with daily activities can even lower your quality of life. This research was conducted to find out the characteristics of women who experience menopausal complaints in Puskesmas Rejosari. This research is quantitative analytic with cross sectional design. The population in this study are all women aged 45-59 years who visited clinics in Rejosari totalling 100 people. The Data used is primary data. The analysis used to determine the presence of bivariat analysis relationship characteristics of women with menopausal complaints. Result of research got woman age and menstrual condition relate to sigh a period of menopause while parity, intrauterine device, Make an index to A period of Body, education, work, nuptials status, and earnings not relate to sigh a period to menopause. 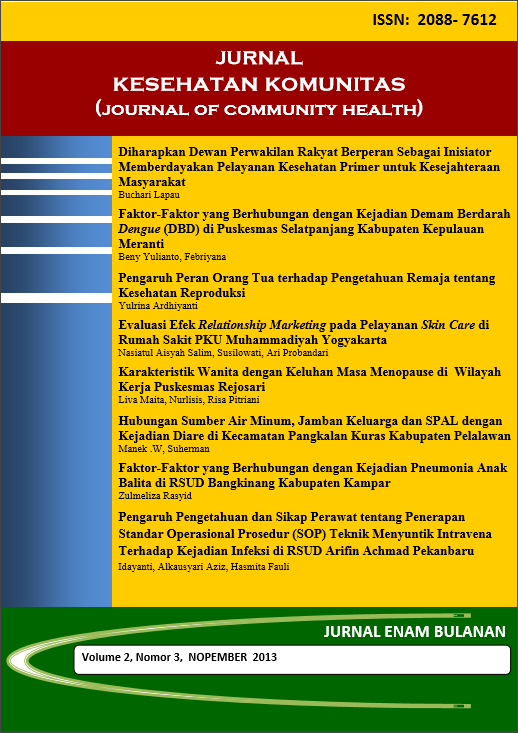 Expected to health centers to provide counseling Rejosari about good nutrition before menopause and preparation for menopause gymnastics through the implementation of the elderly on a regular basis.